I am a huge fan of advent, I love building anticipation and remembering that we are a people of waiting, waiting for His return with as much anticipation (hopefully more!) than we wait for the time to eat together and open presents. We were talking about Fiji and some of the frustrations and joys of living cross culturally. Gideon noted that you have to wait for lots of things here. We wait for the bus, we wait for taxis, we wait for appointments (like hours….just because you have an appointment, that doesn’t mean they will see you at that time…and you most likely will need different paper work and have to come back anyway), we wait in lines at immigration, we wait for visas, we wait for friends to arrive, we wait for services to start. Rarely do people get flustered (okay, Adam said there was some swearing as he waited at customs for our Christmas parcels…the swearing was not from him, though he did wait 4 hours). Waiting is a part of life here. People never expect things at a certain time, their expectation is that they will have to wait. We are not great ‘waiters.’ We have expectations of efficiency…like that things will happen at certain times (yes, it still surprises us….I know I know). We are learning to be okay with the waiting, to adjust our expectations and prepare ourselves to wait ( I may make that sound easier than it really is!). We take books with us, we use that time for communication, we visit with people on the bus and at the bus stop, we play ‘I spy’, we sit and enjoy the view, we pack snacks. We feel our expecations stretched. The waiting is still hard, but it becomes a part of the process, not a hinderance to the process. That is really a huge mind shift for me. Waiting, our waiting for the return of our King, is a part of the process, not a hinderance to the process. God is not flustered by things on earth and how long it is taking for Him to restore things. So why are we? 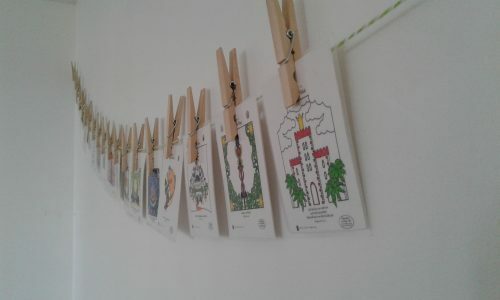 We have a few ‘traditions’ that we do every year, no matter what country we are in, as we contemplate the waiting. One of them is an advent calender of some sorts! This year I am using my David’s Tea calendar from last year (from very amazing friends!!). I hauled it all the way across the sea to use it as our advent calender. Each day the boys take turn opening one and get to do something fun like open an advent book ( I only put these books out for Advent so they are quite special!) or have hot chocolate for breakfast. Tonight they will sleep around the tree. Yesterday we watched a Charlie Brown Christmas and Mickey’s Christmas Carol. I love this and it has looked different each year. Another part of our Advent process is that each evening we gather together before bed to read together. Last year we read Jotham’s journey and lit a candle each night. 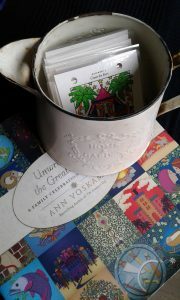 A few years ago, my mom sent us a copy of Ann Voskamp’s book Unwrapping the Greatest Gift. This is our second Christmas using it (though not consecutively). Each night the boys take turn lighting a candle, we do the reading and this year we put the matching picture on a line in our living room to remember the stories (my boys are less into this last part this year, so I usually put them up myself!). I love this journey through scripture and the beautiful language. We have had a very busy advent season (teams here, staff gatherings, meetings and events) so we have been doing this in the boys room, after they are in bed….sometimes at 11:30 at night! 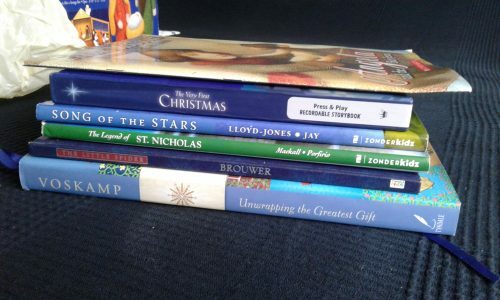 Today was also our last day of homeschool before Christmas. 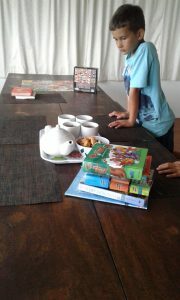 To celebrate we had a tea party while I read some of our things for school. They could eat, drink, and puzzle. It was a great way to celebrate our ‘last day’ (we will take a week off and then keep going). So the waiting continues…not much longer for Christmas, but only God knows how much longer before we see Him redeem the whole world!